Want to have a refreshing new experience? 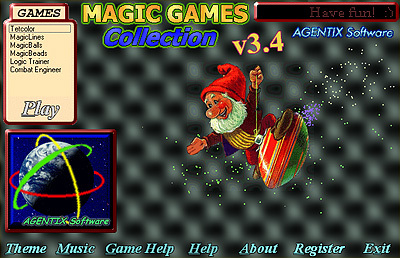 Take a break and entertain you mind with a dynamic dance of logic in Magic Games Collection. You will discover six brain-twisting puzzles for various tastes, including Magic Lines, Magic Balls, Magic Beads, Logic Trainer, Magic Tetcolor and Combat Engineer. These games will delight you with an incredibly exhilarating gameplay, brilliant music and nice visuals. ...... in color. They explode and you score. Remember that each move there appear three new balls. So the quicker you clear board, the longer you survive. Is one of those cute little games that will never let you be bored. Qweas is providing links to Magic Games 3.8 as a courtesy, and makes no representations regarding Magic Games or any other applications or any information related thereto. Any questions, complaints or claims regarding this application Magic Games 3.8 must be directed to the appropriate software vendor. You may click the publisher link of Magic Games on the top of this page to get more details about the vendor.